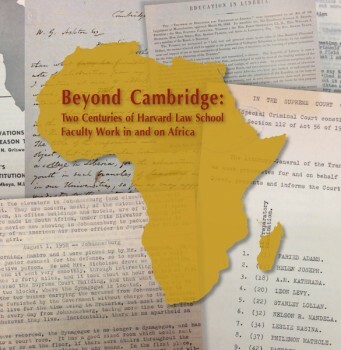 Historical & Special Collections is pleased to announce its new exhibit: Beyond Cambridge: Two Centuries of Harvard Law School Faculty Work in and on Africa, on view in the library’s Caspersen Room until April 27, 2014. It’s no secret that Harvard Law School faculty do not – and have not – restricted their time and knowledge to the confines of Harvard. This exhibit focuses on the experience of four faculty members in Africa. The faculty, Simon Greenleaf, Arthur Sutherland, Erwin Griswold and Roger Fisher did work ranging from the promotion of education in Liberia in the mid-nineteenth century to involvement in South Africa during the country’s transition from apartheid to free elections in the late twentieth century – and donated their respective papers and manuscripts to the Harvard Law School Library. The exhibit, curated by Ed Moloy and Mary Person, will be on view in the Caspersen Room Monday-Friday, 9:00 AM to 5:00 PM through April 27, 2014.